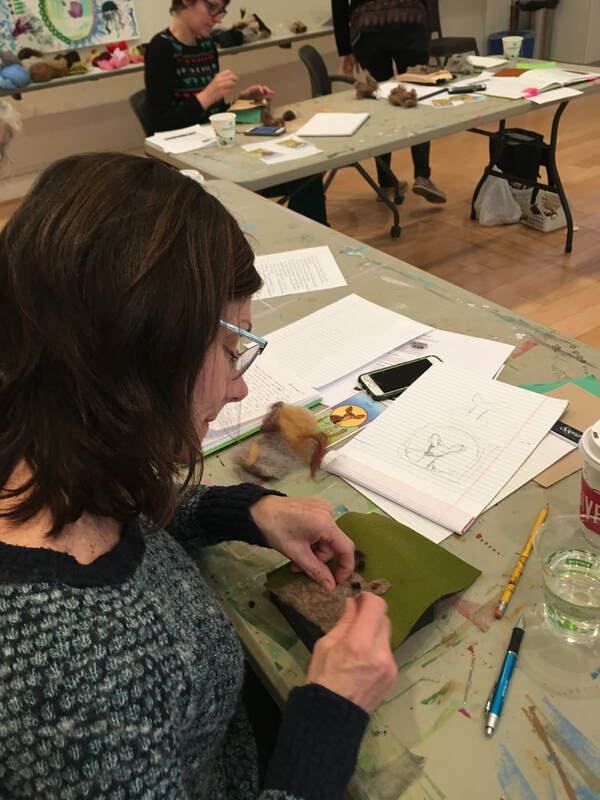 I’ll be a featured instructor in Halcyon Arts Lab’s spring 2019 workshop series! Come find me in one of three doll-making workshops I’m leading. Transformative Healing Doll E-book and doll making instructions. Click for a link to a short book about the process of making the dolls that originally inspired me to make healing dolls. To the left is the original Rhea: Shedding Her Skin, one of the sculptural needle felted dolls that got me started on this doll making journey and one of the topics of this e-book. 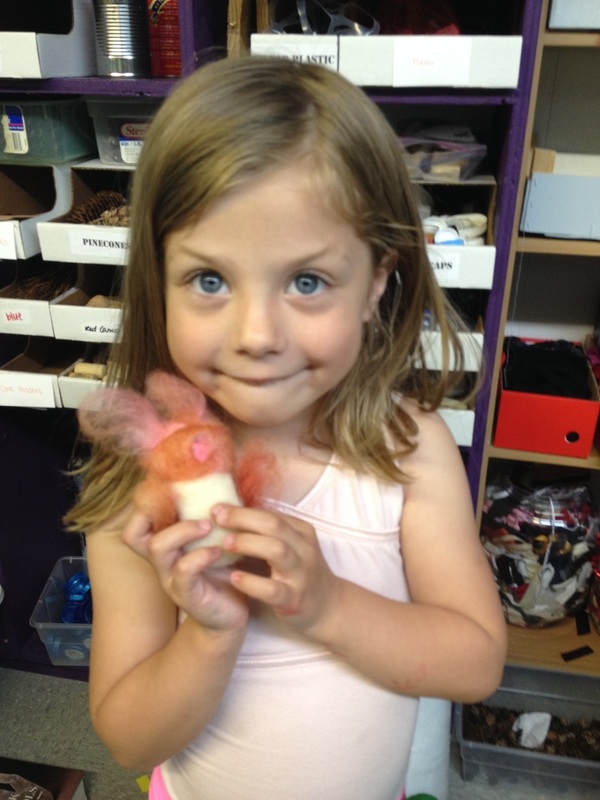 Here is a video that shows one way to make a flip doll. I am offering a FLIP DOLL CHALLENGE which I invite you to join. The video below relates to a workshop I offer about making calendar books. Saturday, December 9th, 2017, 1-5 P.M.
​Come discover your power animal and then create your animal in the form of a needle-felted pin, which can be worn or displayed! In the Shamanic tradition, the specific strengths and unique abilities of each animal come to assist us. They help to clarify our vision and give us courage on our life path. We will meditate, journal and go on a guided visualization together as a way to discover your animal guide(s.) You may want to meditate on your animal prior to this workshop and bring an image of it to work from. Or you can wait and see what comes up. 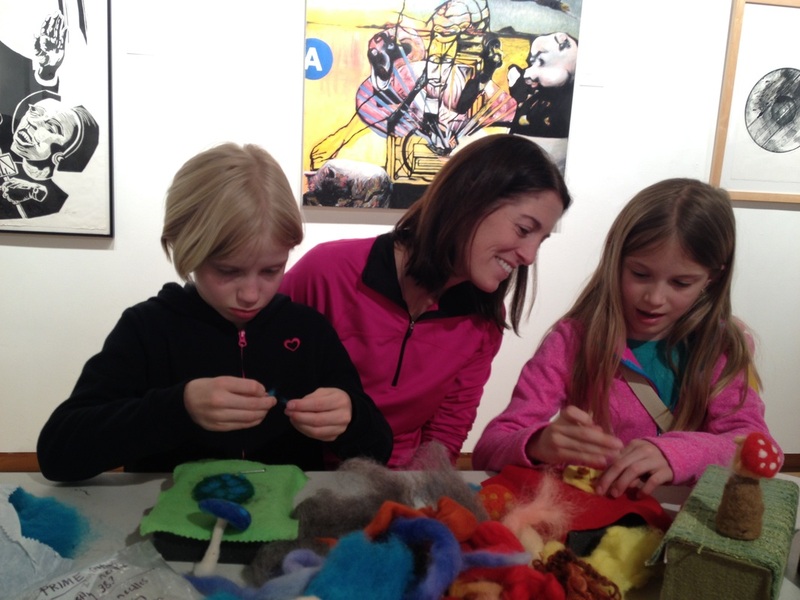 All materials are provided and no prior felting experience is necessary. 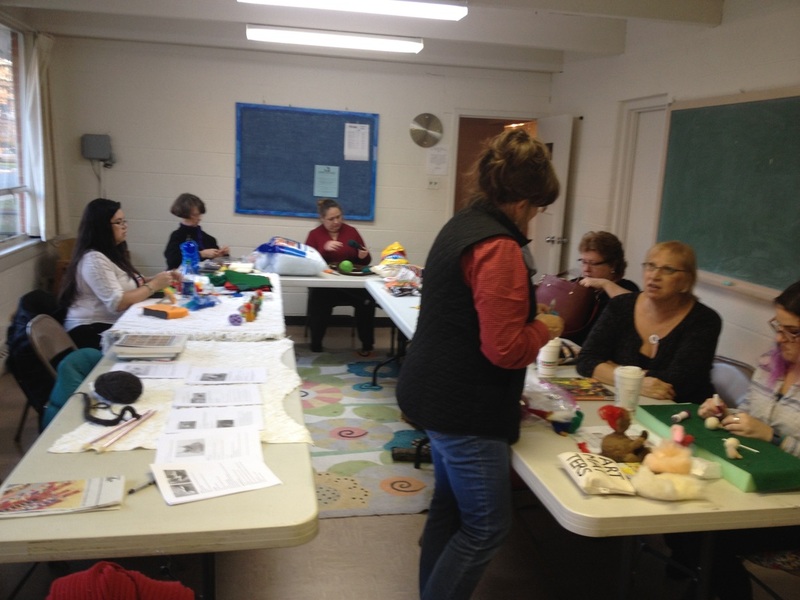 Erika Cleveland, healing doll artist and workshop leader is currently finishing up a grant project called “Revisioning Flip Dolls” bringing flip dolls to the N. Street Village for homeless women. This project will culminate in an exhibit at Artists and Makers Studio, February 2018. 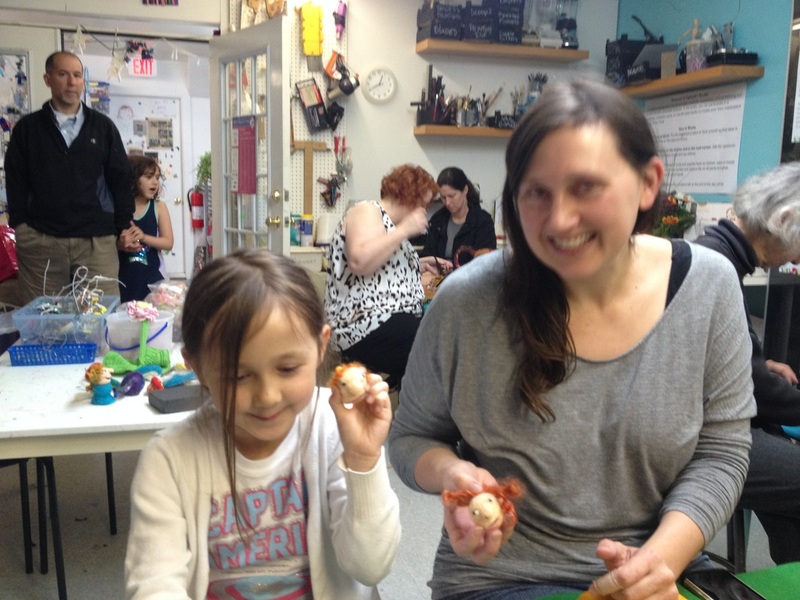 Erika is inspired by the Shamanic path in her doll making and has used the wisdom of her power animals in her personal life as well. She creates her dolls at the Jackson Art Center in Washington, DC and exhibits them at the Torpedo Factory in Alexandria, VA and a variety of other venues. Please contact Erika to reserve your spot in this workshop. The sign up at the Smith Center website will go up approximately two months before the workshop date. This workshop invites you to consider what you envision for yourself for the year 2017. 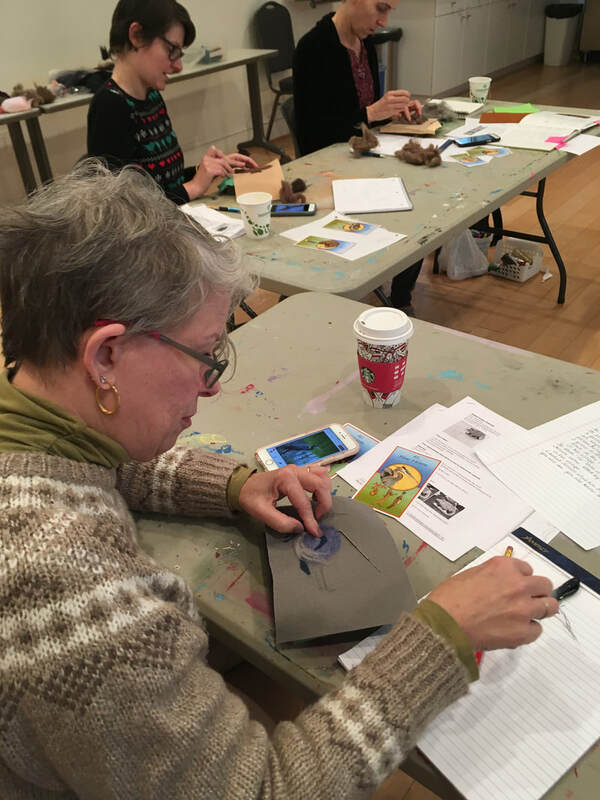 We will make simple mini books from recycled greeting cards that will serve as a guide to vision our way into the New Year. We will also use guided visualization and journaling to clarify our blocks and to determine tools to work through those blocks. No previous experience necessary and supplies are provided. Come prepared for a enriching journey into your inner life. "Materialized Magic: Mythical Creatures in a Yarn Bomb Habitat"
Free workshops started December 2015 at Convergence in Alexandria. Others took place at various locations in the DC/VA area, with teaching in crocheting, knitting and needle felting in preparation for the "Materialized Magic: Mythical Creatures in Yarn Bomb Habitat" show. We've had meet ups at Convergence, the Torpedo Factory, UpCycle (now in a new location at the Durant Center in Alexandria, VA.) We met with seniors at the Jefferson Retirement Community in Arlington, VA. On June 5th, we held sessions at the Arlington Arts Center, the site for the final exhibition of all of the imagery created by the community and the large figures by Erika and Stacy. The Arlington Arts Center in Arlington, Virginia was the first venue for our show! The show began on June 25th and concluded August 5th (extended from its original end date. After the show ended at the AAC, it moved to the Special Projects Gallery at the Torpedo Factory, for a run through the end of August. See Materialized Magic FB page for images of the show. 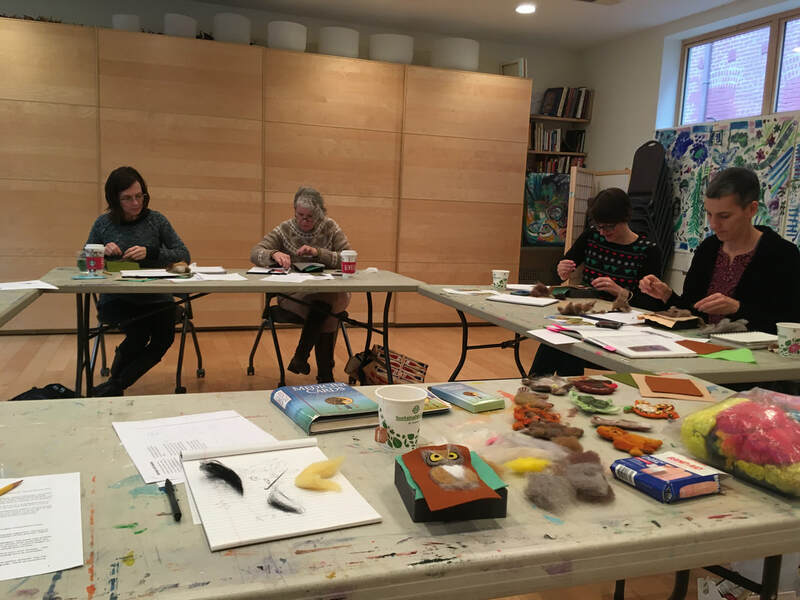 ​Stacy Cantrell and I won a Crave grant, co-sponsored by Convergence and the Torpedo Factory to open to the larger community-each workshop in preparation for the show will give participants (that means you! 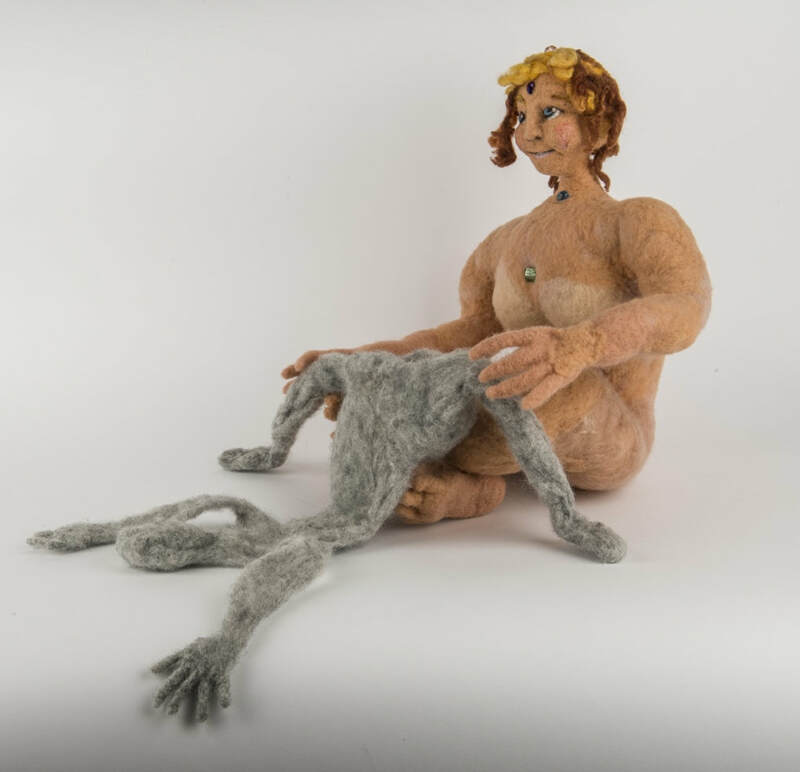 Anyone can participate) a chance to create felted, crocheted and knitted details which will then become the environment for Stacy and my large "creatures," of which Tumnus (right) is one. There will be a large tree, a waterfall, sky elements and more. 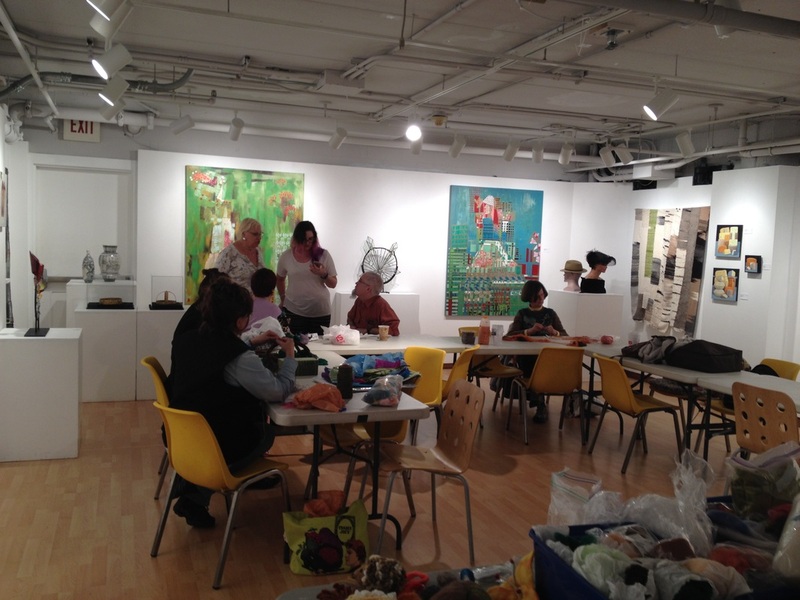 We will be filling the entire gallery with an environment made entirely out of knitted, crocheted and needle felted elements. After the exhibit, parts of the installation will be donated to local places such as nursing homes or schools. 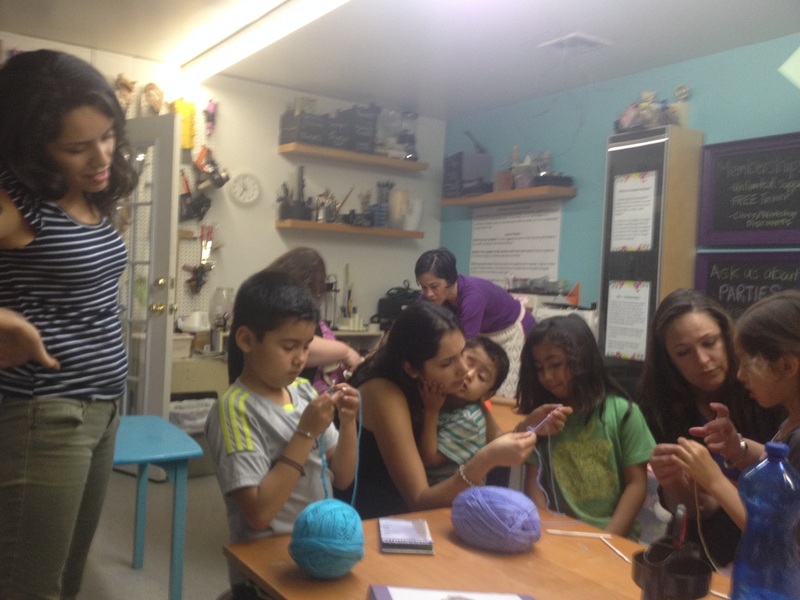 Convergence is one of the organizations, along with the Torpedo Factory, that helped fund our micro-grant which makes this project possible. Here's more about Crave, (Creating Resources for Artistic Vision and Engagement), representing the combined visions of Convergence and the Torpedo Factory to support artists in the community. Part of the plan for the exhibit was for the various habitat elements to be donated to sites that could use them and add to them in an ongoing way. All of the elements were donated to the following sites. The Jefferson Retirement Community received the ocean element. Upcycle Center for Creative Reuse received the tree. And two Reggio Emilio early childhood programs received the pond feature and the desert feature. We are so pleased that the show will live on in these new sites! Let’s have fun! It’s summer and just after the summer solstice. Let’s enter the magical world of summer fairies. It’s time to believe in fairies and bring their healing and playful energies into our lives. We will make tiny needle felted fairy villages, using our imaginations to create its inhabitants. You don’t have to know how to felt. It’s easy and fun. We will do a bit of journaling and meditation along with the fun. Saturday, May 21, 2016, 1-4 pm. Flip dolls (or “Topsy Turvy dolls”) are two sided dolls, connected in the middle at the waist, and separated by a skirt, which flips over to one side when the other side is revealed. With their built in connection to each other, they’re the perfect medium for exploring the ways in which two (or more) sides of our personality can be connected and yet so different. An alter ego is the opposite side of our personality. We may feel like that side holds our darker qualities. Or maybe this alter ego side represents hidden strengths we haven’t been ready to show to the world. Often, what we find is that this side (whether dark or light) contains qualities that allow our true inner light to shine. 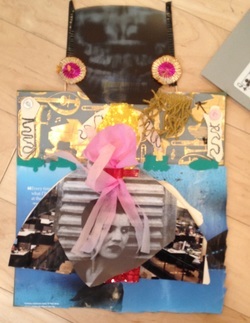 In this workshop we created a two-dimensional relief flip doll and embellished it. Through brief journaling and visualizations, we discovered this hidden side of ourselves. Imagination sparking materials were provided. You don’t have to be an artist to participate. But you do need to be willing to be open and curious to what emerges. 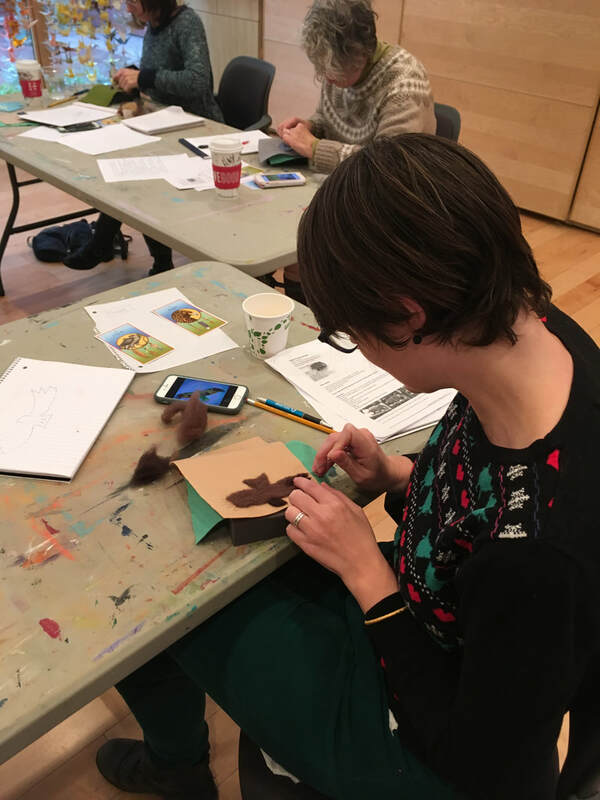 Erika Cleveland, artist and workshop leader has recently been curious about flip dolls as a historical artifact and has been creating her own version of them and exhibiting them. She creates her dolls at the Jackson Art Center and exhibits them at the Torpedo Factory and a variety of other venues. To find out more, visit her website: www.transformativehealingdolls.com or her FB page: Facebook.com/transformativehealingdolls. 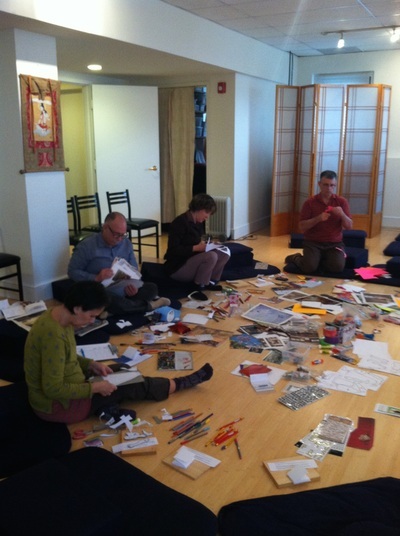 Mapping Joy: A Calendar/Journaling Workshop, part II took place on February 27th. 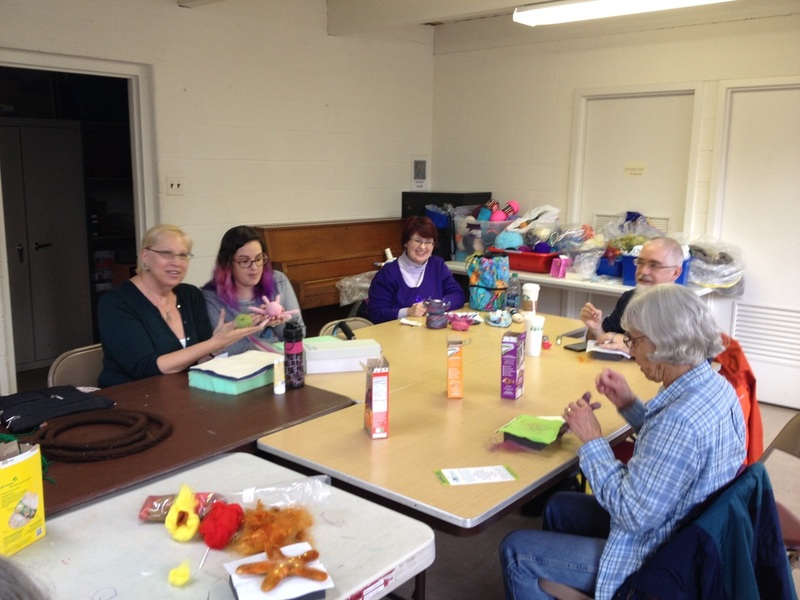 Participants had a chance to explore the crown binding book to make a 7' x 10" calendar or journal. This was a larger version of the book made in the previous session with more time for embellishment and for sharing with the group. See above (on this offers page) for a video describing how to make the spine for the crown binding book. 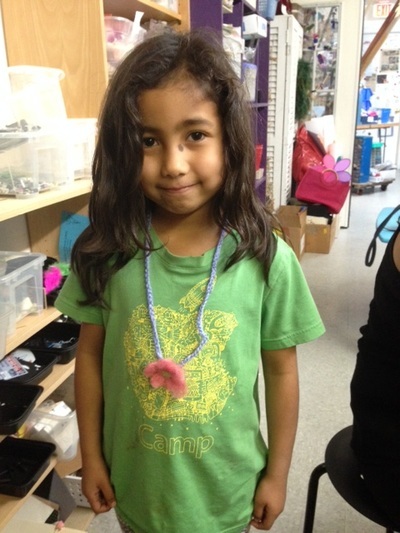 "Exihilarating and a wonderful learning/slowing experience." "Enjoyed the opportunity to arts in an encouraging environment with other people." This short, introductory workshop provides a window into another method of tracking your days, where you can create space to invite qualities such as joy and spaciousness into your life. You will do some journaling and guided imagery to identify what qualities you want to experience more of. Artist and doll-maker, Erika Cleveland will introduce you to a method of using a non-linear calendar. No previous art-making experience necessary. Materials will be provided to create the structure of a small, pocketbook sized journal, which can be used in 2016 to track what really matters to you. You will leave with lots of ideas on how you might further embellish and expand on your journal in the year to come. Saturday April 25, 2015, 10 am to 4 pm. We don’t have control over much that goes on in our bodies. Aging, sudden or long term illness or just the wear and tear of daily life all affect our bodies in ways that we can’t control. Let's take some time to honor our bodies-to recognize, bless and affirm the work that our bodies do for us, by creating visual felted maps of our internal landscape. When we sit and truly absorb the wisdom of our bodies, the scary stuff seems less scary and the good stuff gets absorbed on a deep cellular level. Meditation, guided visualizations, journaling and hands-on demonstrations will bring you to a place of safety where you can feel comfortable creating, no matter what level of experience you have. All that is needed is: openness to play and willingness to be guided by your own creative spirit. Materials will be provided, though you may want to bring small items with which you can embellish your landscape. Workshop filled with a wait list. "Erika was a terrific leader! I had a wonderful day." "Good reminders to take time out for art making, great self care, challenging to learn a new skill." "I very much appreciated the metaphors and symbolism discussed throughout the experience, the intro, the meditation, and art making. 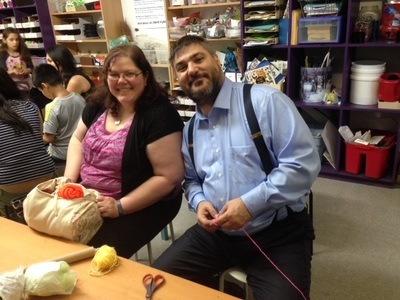 Appreciated Erika's unique background in art therapy and technical, art skills...helped me to be kind to myself, approach my body with curiosity, patience and acceptance." 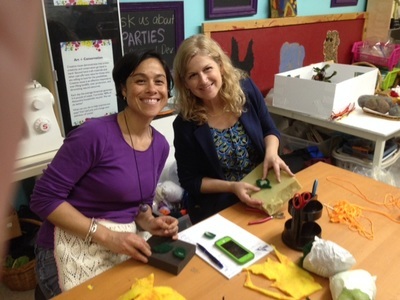 "The entire workshop was valuable! It brought me to gratitude for my body." "Reconnected with approach of listening to the body." 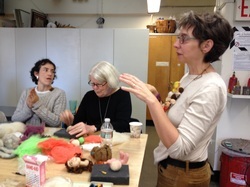 doll head, felted rock and tiny felted landscapes made by one of the participants in "Reclaiming the Self Through Therapeutic Felting"
This workshop will focus on the unique techniques of wet felting and sculptural needle felting. Both are highly adaptable techniques which can be used with a wide range of clients. Wet felting has existed since approximately the beginning of recorded time, whereas sculptural needle felting began as an artistic technique in the 1980’s. Requiring simple tools and set-up, both techniques are fairly easy to learn and to teach. During this six hour workshop, participants will view examples of both techniques and will then have the opportunity to make simple needle felted dolls and to work with patterns and designs in wet-felted panels. 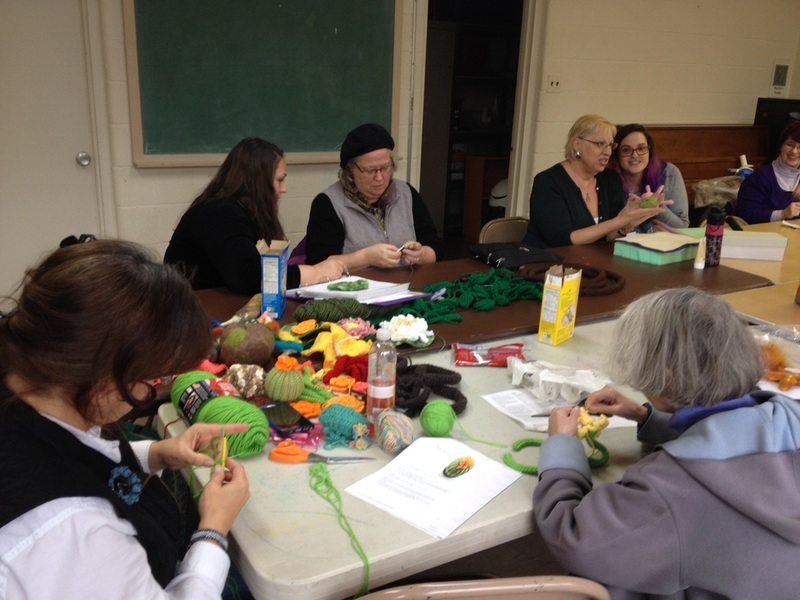 Special emphasis will be placed on ways in which felting can aid in integration and acceptance of all parts of the self. We will make use of the soothing and integrative aspects of the materials, while also addressing some challenges that can arise while working with felt. Didactic materials will be provided, describing the therapeutic benefits of each technique with a variety of populations. 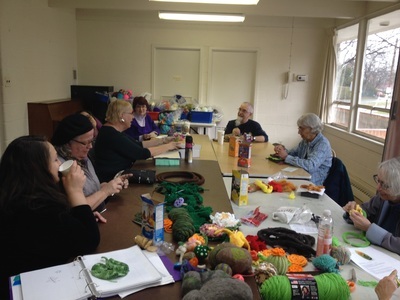 Examples will be given of the uses of felting with the instructors’ experiences, in the one case the substance abuse and physically handicapped populations and in the other within the context of personal growth workshops for women experiencing major life transitions. 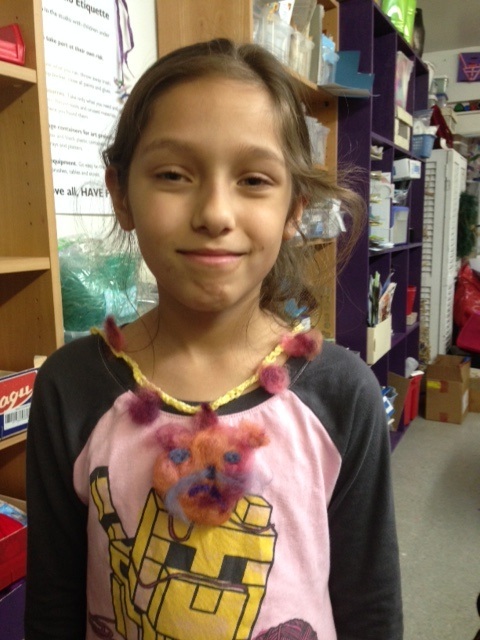 No prior experience with felting necessary. Materials will be provided. 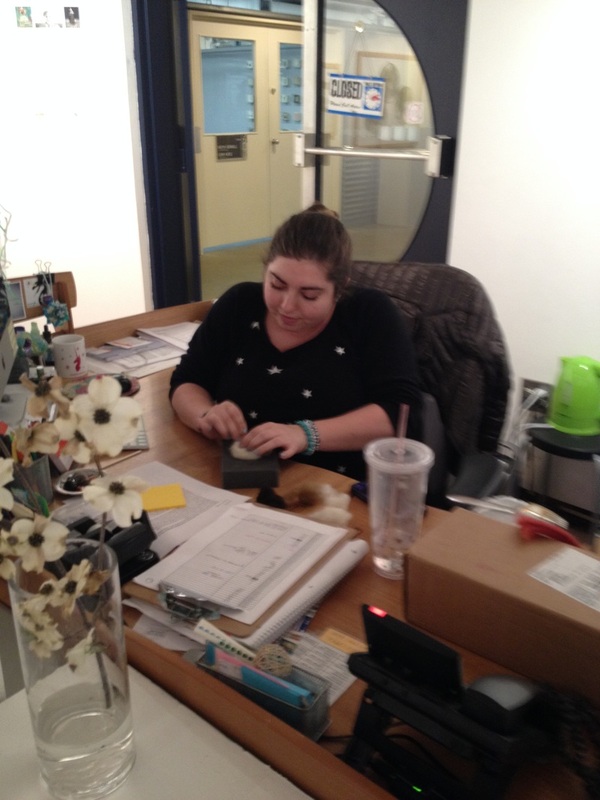 "I expected to learn something new and that expectation was greatly exceeded, more than I imagined." 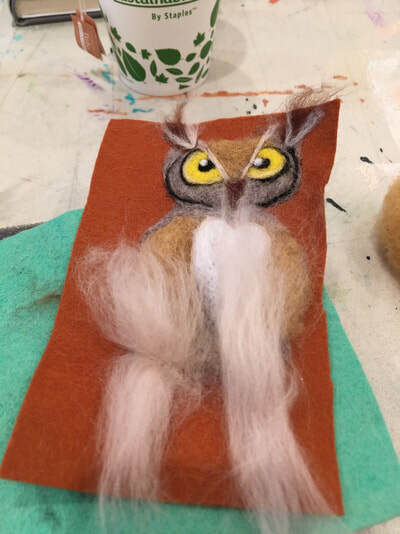 "Even though I had no experience with this media and never felt 'drawn' to it in the past, it is because of this experience that a new form of self expression has opened up for me-could have been a whole day's workshop (on needle felting)-incredible workshop!" "I loved this workshop and am so glad I came. The techniques were wonderful!" November 8, 2014: "Felting as a Therapeutic Medium" Expressive Therapies Summit, NYC. 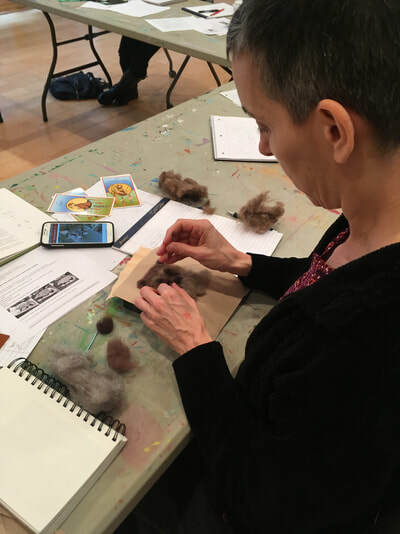 This all day workshop is designed to teach arts therapists about felting but is open to anyone interested in felting and healing. 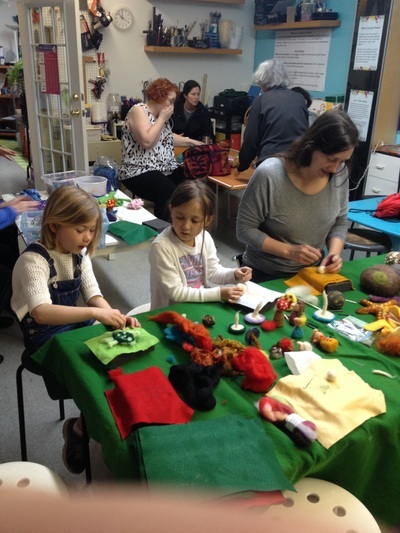 Participants will create a life-like needle felted doll and a wet felted rock. 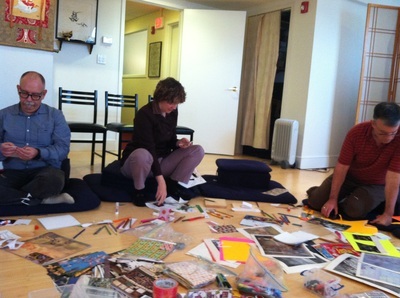 "The presenters gave us awsome tools in therapy." "(I was) impressed by their breadth of experience." "(They) did a great job of explaining the techniques." 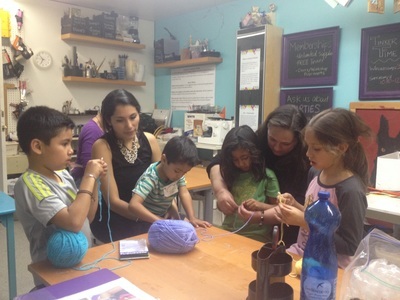 October 18th and 24th, 2014: "Doll Making from The Inside Out." 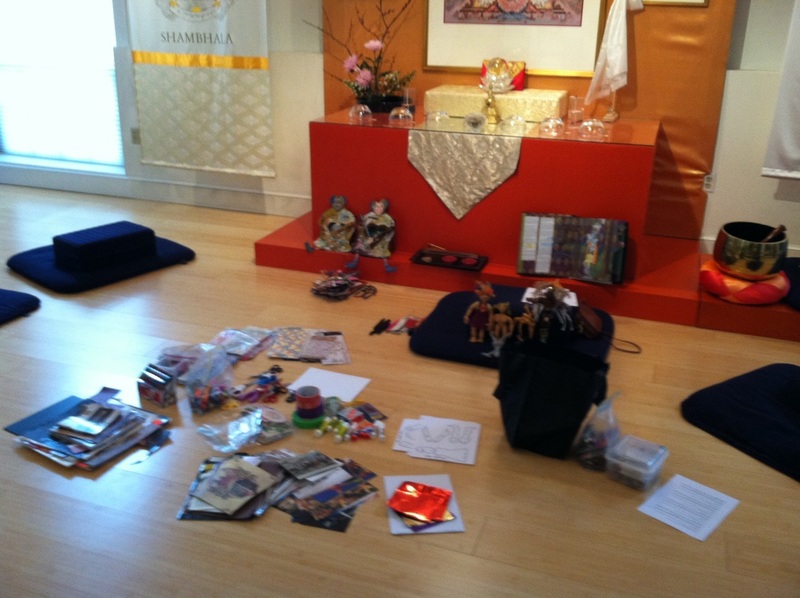 at the Smith Center for Healing and Arts, DC. This two-part workshop will lead you into a safe space to contemplate and explore who you are and where you want to go. 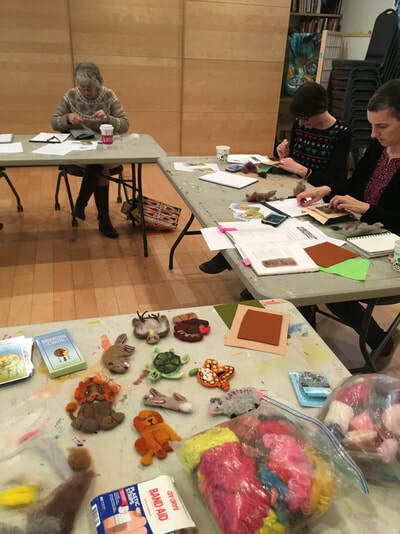 Participants will journal, meditate, and create a felted doll that represents their inner guardian. This workshop focused on the unique techniques of sculptural needle felting and wet felting. 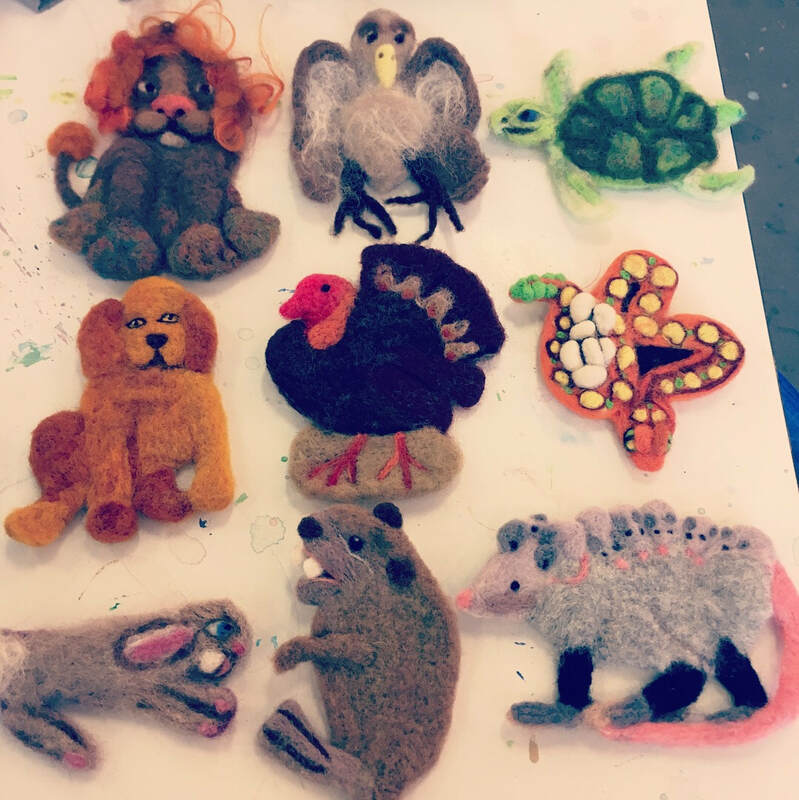 It was designed for the PATA (Potomac Art Therapy Association) membership as a way to introduce them to these two felting methods. 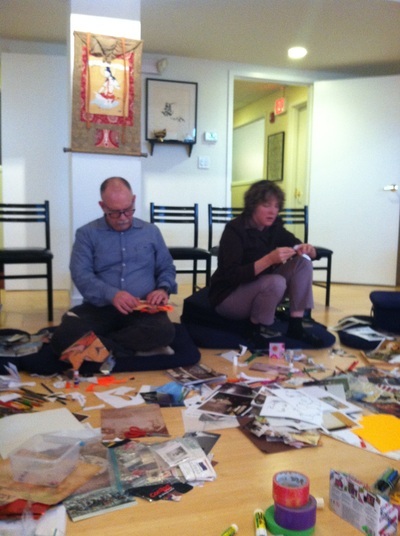 March 29th, 2014 workshop, "Discovering Inner Spaciousness," at the DC Shambhala Center as part of their annual Arts Day. 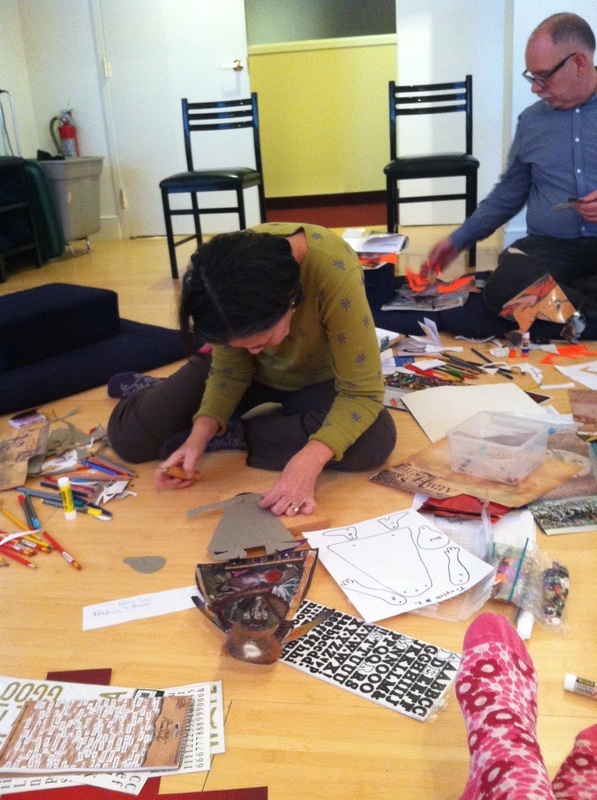 Participants meditated on inner spaciousness, wrote a mini book on that topic and then created paper dolls. It's a beautiful space and the participants' art work and sharings were heartfelt. I was truly moved. 'The honesty with which Erika spoke of her throat issues and her journey of healing gave grounding to everyone-it set the stage, the purpose for what we were about and gave us permission to cut to the quick." "The workshop surpassed any expectations I could have had!"